Despite medical marijuana’s unquestionable worldwide momentum, it hasn’t yet been proven scientifically to remedy most of the conditions governments have authorized it to treat, according to an influential new analysis of existing research. While pro-legalization advocates don’t disagree with the analysis’ findings, they point out that the barriers to legitimate research on cannabis’ medical efficacy have been so substantial in the U.S. that President Barack Obama’s administration this week slashed some of those bureaucratic hurdles in a historic action — and yet marijuana still remains more difficult to study than cocaine or heroin. The new compendium’s findings, published in the Journal of the American Medical Association on Tuesday, are based on 79 trials involving nearly 6,500 participants. The analysis found that marijuana helps with some ailments, but its efficacy regarding most related conditions is unproven — a finding that didn’t surprise the chief medical officer of Colorado, where medical pot was legalized in 2000. The new analysis shows that medical pot has helped patients with severe pain, nausea and vomiting related to chemotherapy and spasticity from multiple sclerosis. But when it comes to the numerous other qualifying conditions that make up most medical marijuana programs, which vary tremendously from state to state and often include PTSD, glaucoma, arthritis and Parkinson’s disease, the report says the evidence isn’t there. Wolk points to the $8 million of grants Colorado’s Board of Health approved in December 2014 to study the medical efficacy of cannabis on childhood epilepsy, PTSD, Parkinson’s, inflammatory bowel disease, pediatric brain tumors and spine pain. “(The analysis) absolutely reconfirms the need for this research,” Wolk said. Dr. Sue Sisley is one of the researchers working with Colorado’s money. She and her Arizona-based team’s pot-and-PTSD study was awarded $2 million from the state, but many of the federal-level obstacles she’s been battling for years still exist — including the National Institute on Drug Abuse’s monopoly on study drugs, she said. The analysis represents the most comprehensive review of medical marijuana research to date, but that’s not saying much, legalization advocates say. Amanda Reiman is a professor of drug and alcohol policy and substance abuse treatment at the University of California, and she compares the federal government’s attitude toward marijuana research to trying to ride a bike with your legs tied together and your arms tied behind your back while blindfolded. “Is the clinical evidence there? No,” said Reiman, who is also manager of marijuana law and policy at the pro-reform Drug Policy Alliance. “But it’s not for lack of trying. Legalization opponent Kevin Sabet said the states’ existing medical marijuana laws are rooted in marketing, not science. “Anyone familiar with the literature already knew all this, but of course the typical American is listening to 30-second television commercials that say ‘marijuana cures cancer’ and they’re not reading the Journal of the American Medical Association,” said Sabet, who leads the anti-legalization group Smart Approaches to Marijuana and was in Washington, D.C., this week to testify at the U.S. Senate Caucus on International Narcotics Control hearing on Wednesday. “What this shows: They have shot over the mark in terms of what they’re allowing marijuana for. Because both sides of the legalization conversation agree that more research is needed, where do their philosophies split? It’s in the waiting. The federal government and Sabet’s group want to wait and see. Legalization activists want to charge ahead with their own anecdotal research. Wolk is somewhere in between on the waiting issue. Wolk wants science to lead the conversation surrounding medical pot, and he testified in 2014 against allowing PTSD on Colorado’s list of eligible conditions. 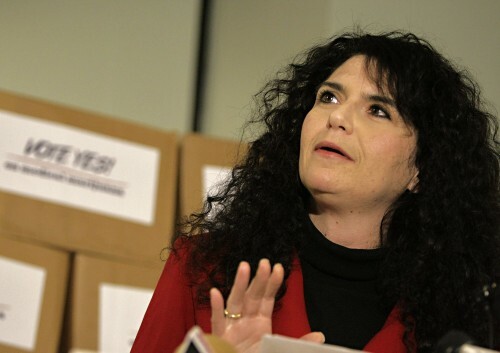 But after the state’s Medical Marijuana Scientific Advisory Council recommended adding PTSD to the list in April, Wolk will propose the addition to the Board of Health in July. Wolk said he’s heard convincing evidence that some PTSD patients are already on the state’s medical pot registry, hiding behind different ailments.